Arthur MacDonald is a Canadian astrophysicist. McDonald is the director of the Sudbury Neutrino Observatory Institute and holds the Gordon and Patricia Gray Chair in Particle Astrophysics at Queen’s University in Kingston, Ontario. He was awarded the 2015 Nobel Prize in Physics jointly with Japanese physicist Takaaki Kajita. 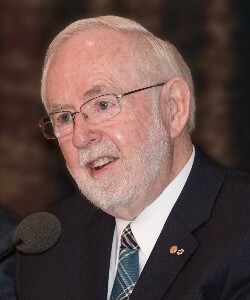 McDonald worked as a research officer at the Chalk River Nuclear Laboratories northwest of Ottawa from 1970 to 1982. He became professor of physics at Princeton University from 1982 to 1989, leaving Princeton to join Queen’s University. He is currently the University Research Chair at Queen’s University and a board member at Perimeter Institute for Theoretical Physics.